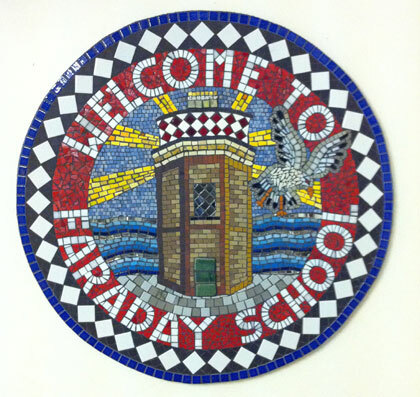 This school sign was made from glass and ceramic mosaics with the children of Faraday School, aged 3-5 working with Becky Sicardi and Clem Riches. As the school is on the edge of the River Lea and River Thames, overlooking two old and beautiful lighthouse ships as well as an original lighthouse, the imagery of a seagull and the lighthouse was agreed upon with great excitement by the children. Every day the children come to school and are welcomed by their school sign. 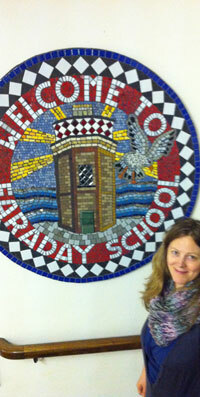 "We were delighted here at Trinity Buoy Wharf that Maud and Artyface produced this wonderful school sign. The approach of working with the school pupils to come up with the design is really great. The end result is such a fresh welcome to the school. Maud always delivers a really lovely result and on budget and on time."